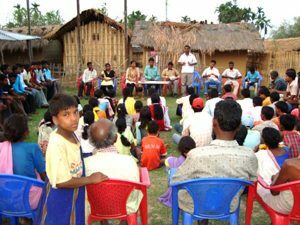 For the last 11 years LCHR has been involved in creating legal awareness and building up legal capacity among the rural people in more than 17 districts of Assam. LCHR has implemented this programme in partnership with several voluntary organizations, District Legal Services Authorities, Gauhati High Court Legal Services Committee, Assam State Legal Services Authority, UNICEF etc. in order to disseminate legal literary among rural poor and vulnerable sections of the society. Through this initiative of LCHR more than 50 thousands rural people from 17 districts have learnt the provisions of Right to Information Act, Right of Children to Free and Compulsory Education Act, labourers rights, child rights, women rights, Public Distribution System or right to food, MGNREGA, free legal aid to the poor, national and state security schemes and many other legal provisions from Judicial Officers, Magistrates, Judges and advocates who, along with the LCHR staff members, went out to the remote places to spread the legal information and awareness.